This is a project, of which Farnborough Lions Club is extremely proud and since the launch of this project (in 2003) the Club has distributed approx. 7,500 Bottles. Together with other Lions Clubs in the Zone - Aldershot, Fleet, Hart, Hook & Odiham, and Yateley we have distributed approximately 15,000 bottles. As the name suggests, the personal information is kept in a small plastic bottle. The bottle has a push-fit lid and is big enough to hold the necessary information. The bottle is then kept in the fridge, where the emergency services will expect to look for it in the event of being called to your home. They will be alerted to your membership of the scheme by two ‘green cross' labels. One is fixed to the back of the front door (or the door most used to access the premises), the second is attached to the door of the fridge. 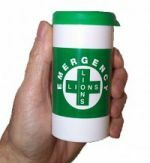 Click here to watch a video of Lions Clubs in Ireland giving out Message in a Bottle in their communities.